So let's get this straight; Potion Explosion is a board game, based on a mobile app that now been turned into a mobile app. Confused? Don't be, because Potion Explosion is a fun little game that works just as well on both the tabletop and your telephone or tablet. The premise is simple, you need to brew potions and do it better than your opponent. To do this you will need to gather four different ingredients each represented by coloured marbles, in varying quantities. Each turn you are only allowed to collect one ingredient from the rack, but if by doing so two ingredients of the same colour come into contact then they explode and you get to collect all of those of the same colour. If by removing these ingredients you then cause another group of the same colour to come into contact then you also get to collect those as well. It means you can set off a cascade and grab a handful of ingredients by simply removing one key ingredient. 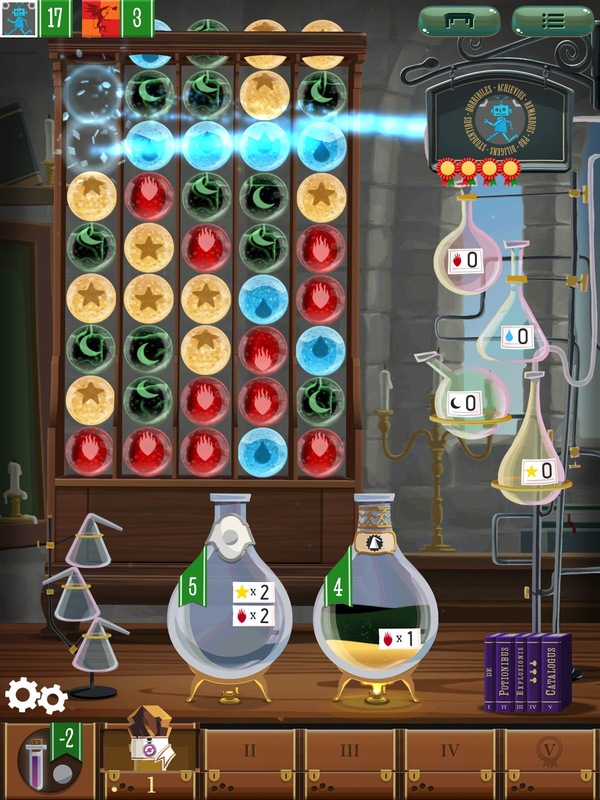 If you have every played something like Candy Crush Saga or Bejewelled then you get the idea, but there's a big difference; unlike the aforementioned mobile game that encourages the purchasing of power ups and in game currency, Potion Explosion is a game of strategy and immediately becomes a more interesting game to play in the process. There are a couple of neat tricks to add to the mix. The first is that you can lose 2 points to collect any one ingredient, thereby allowing you to set up a combo. The second is that not only do completed potions award you points, they can also be consumed for instant special abilities, again allowing you to pull of some tricky combos. There are 8 potions in the game and only six potions will be used each game, so there is plenty of variation between matches. The interface for the app is particularly well designed. Everything has its place and works flawlessly. Even the music isn't too bad, being a jaunty tune that matches the theme nicely. I still found myself reaching for the mute button after 10 minutes mind you, there's only so much of a loop your ears can trade. If I have a complaint about the app, it is that there are only two difficulties available from your computer controlled opponent: easy and hard. Whereas the easy level does feel difficult at first, once you get the hang of using your potions it soon becomes a push over. Unfortunately I then found it a massive jump into hard, but that could just be because I’m rubbish. My other worry is that with only two difficulty levels, there is little to do once that hard AI has been beaten. 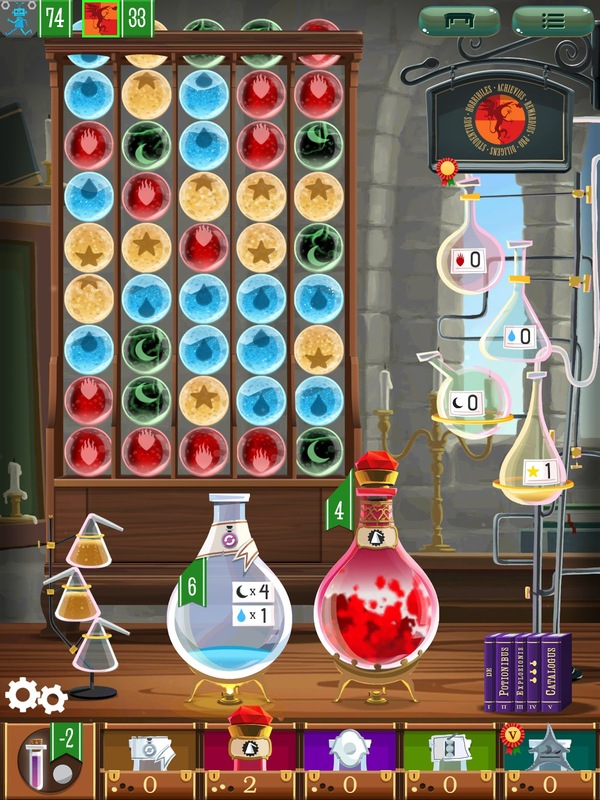 I feel that Potion Explosion is crying out for a challenge mode, where you have only one turn to complete all the potions. Hopefully Asmodee and Horrible Games will add this later. 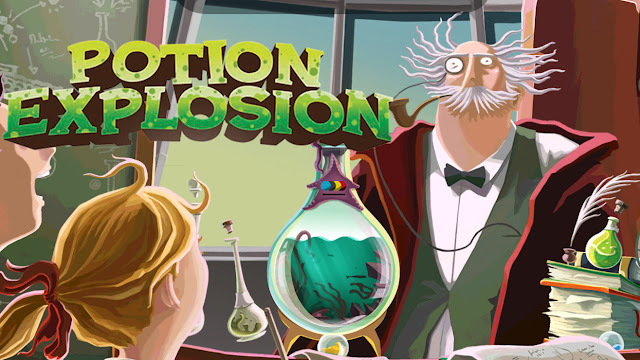 Of course it’s not a digital interpretation of a board game if you can only play the game by yourself and Potion Explosion is linked into Asmodee’s online game system. It’s a really flexible system, allowing you to play either asynchronously waiting for your opponent or just stay online and I was really impressed by how smooth it ran. I’m just lacking the required friends to play against (by the way my user name is Wahoffelmadenga). Whenever I review an app version of a board game I ask myself, does the video game version complement or replace the physical version. 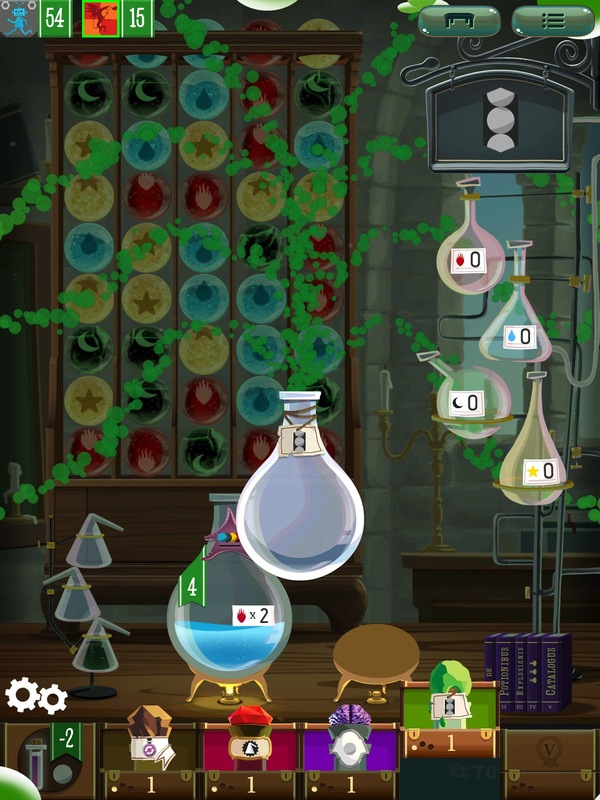 Whereas this app version handles everything smoothly, and avoids any arguments regarding which ingredients exploded it really can't replace the tactile feel of removing the, marbles from the cardboard potion draw. Even if both version of the game are mechanically the same, the physical version just beats it but that doesn’t stop this being a beautifully made and flawless digital translation of the original.